The aim of this study was to evaluate the influence of high intensity strength training on sprint rowing after 24h, 48h and 72h. 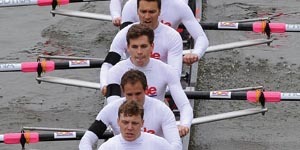 Ten club-level rowers were asked to join the study by Gee et al. (2012). Prior to the study, the participants completed at least 12 weeks of strength training (two times per week) to accommodate with the protocol. On day one of the study, baseline measures were taken from 250m ergometer performance (250ERGO) and maximal counter-movement jumps (CMJ). On day two, the high intensity strength training session (ST) was carried out. 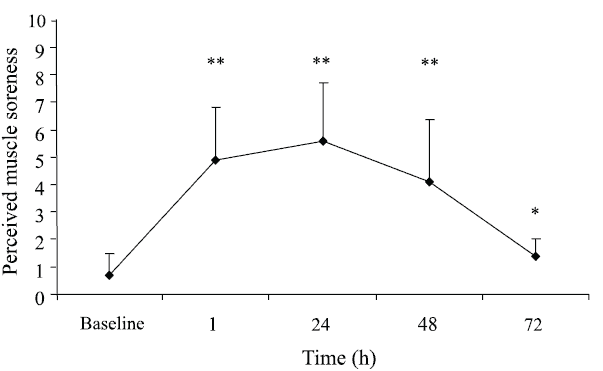 The rating of perceived muscle soreness and the level of creatine kinase were assessed 1h, 24h, 48h and 72h post ST and the 250ERGO and CMJ were repeated 24h, 48h and 72h post ST to assess the recovery rate. It was found that the perceived muscle soreness increased significantly after the ST, reached its peak 24h and still stayed relevant at 48h and 72h post ST. CMJ was significantly decreased at 48h post ST while creatine kinase and 250ERGO were significantly different from the baseline measures for the first 24h. As rowers might not perform at their best 24h post high intensity strength training, coaches could use the data provided in the current study for better scheduling of the periods of strength trainings and sprint rowing events. Change in perceived muscle soreness (scale: 0 – 10) following high intensity strength training. Values are expressed as mean ± SD (n = 10). ** = significantly higher than baseline (p < 0.01). * = significantly higher than baseline (p < 0.05). Gee et al., 2012. Gee TI, Olsen PD, Garland Fritzdorf SW, White DJ, Golby J, Thompson KG. 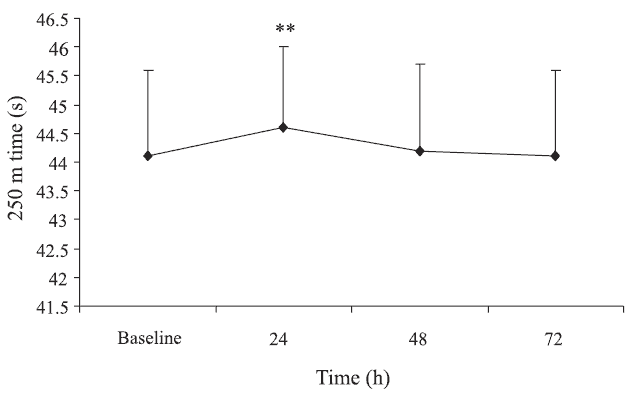 Recovery of rowing sprint performance after high intensity strength training. International Journal of Sports Science & Coaching, 2012; 7(1).